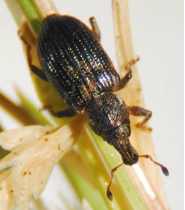 The annual bluegrass weevil (ABW) is an insect that can get very ‘angry’: insecticide resistant that is. Surveys have indicated that resistance in this insect is wide spread. Dealing with insecticide resistant ABW can quickly become a nightmare. The best thing to do, if you still can, is to not get the weevils ‘angry’ in the first place. Once they are resistant, there may be no feasible way of getting them susceptible again. There are no silver bullets out there and none in development. I estimate that any golf course that has tried to intensively control ABW for at least 5 years will have some level of insecticide resistance. With intensively I mean multiple applications per year over large proportions of the golf course. Resistance tends to sneak up on people. First there are some small problems here and there that will be excused by ‘missing spots’, ‘timing off’, ‘poor weather conditions’, etc. Unfortunately, the typical reaction is to ratchet up the spraying activity. Seeing a lot adult ABW all over an area just days after an adulticide application should be an eye opener. Unfortunately, at this point the ABW should be already pretty resistant. You can see a simplified model of how resistance develops in the ABW presentation on my Rutgers Entomology webpage. Is getting insecticide resistant ABW while trying to keep your job an inevitable crux? Absolutely not. I know of several golf courses that have had ABW for many years (up to 30!) and still consider them more of a nuisance then a huge problem. Such courses generally have practices all along what I preaching these days (see below). 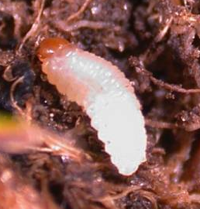 Insecticide resistance is caused on a course-by-course base by excessive insecticide use in time and space and poor insecticide resistance management. A low proportion (under 1%) of individuals in any given population naturally have mutations in genes that allow them to better tolerate insecticide exposure. When insecticides are applied, these individuals have a better chance to survive than the rest of the population. Hence, they will have an increased impact on the genetic makeup of following generations. The more often insecticides are applied and the greater the proportion of the total population that is exposed, the faster will significant resistance develops. The primary mechanism involved in ABW insecticide resistance seems to be increased enzymatic detoxification. Like most higher organisms, ABW naturally have whole families of genes that code for detoxifying enzymes. In resistant individuals, the number of copies of such genes can be increased and/or the genes are more turned on. Either way resistant individuals produce higher concentrations of detoxifying enzymes that break down active ingredient more effectively. Unfortunately, enzymatic detoxification is not very specific; therefore, the efficacy of most presently available active ingredients can be reduced in resistant populations. Even presently still effective active ingredients can lose efficacy if overused. Based on our lab tests, by far the greatest resistance to date can be observed against pyrethroids. In the most resistant populations more than 300x as much active ingredient had to be applied to the adults to cause 50% mortality for both Talstar and Scimitar. For chlorpyrifos, the present go-to alternative as an adulticide, the highest tolerance levels observed was 16x. But chlorpyrifos has not been used as much over the last 10+ years. Hence, resistance to chlorpyrifos is likely to worsen if it is overused. 3) Risk assessment based on the percentage of Poa annua in the various areas. Research by our lab and others clearly shows that Poa annua is much more susceptible to ABW damage then creeping bentgrasses. Therefore, the thing that in the long run makes the most sense is to reduce Poa annua as much as possible, wherever possible. This would reduce the need for insecticide applications and with that the selection for resistance. More on Poa vs. bentgrass and ABW to follow.